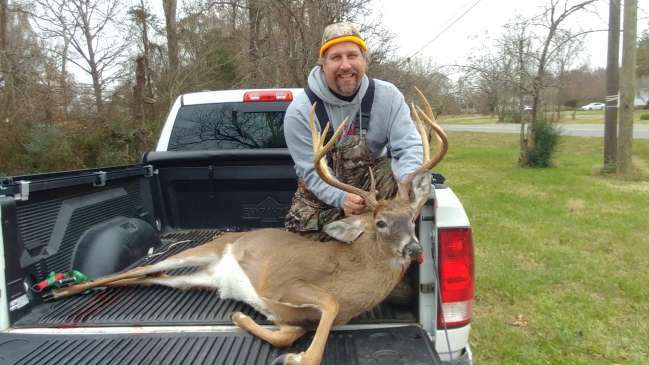 my name is Eric Eglinger and i shot this huge buck up in Caswell County and the gamelands. i was hunting my usual are that I hunt whick is up on a small knoll overlooking a ravine that leads into small thickets. i had seen about 4 does early about 7:30 am come my left which was the ravine and i thought to myself this is going to be a good day. i had put out some doe urine before i climb up the tree in my climber and the wind was blowing just right down into the thickets. and bout 9:00 am a movement caught my eye and i thought i saw and antler so i put my rifle and look through the scope and sure enough i deer was looking back at my. so i thought to myself well got antlers it will go with me today. but i couldn't see his body so i thought ok turn your head and i will put one through your neck. and that is exactly what happened. after i shot i couldn't hear him crash because i head my hear protection on. so i waited about 1/2 hour and climbed down and went to the spot where i shot him but no blood so i just stared a zig sag pattern through the brush and there he was about 25 yards up. but i did not realize how big he was to i got to him.